You can create a new work order template by going into Winery Setup – Templates – Work order templates. 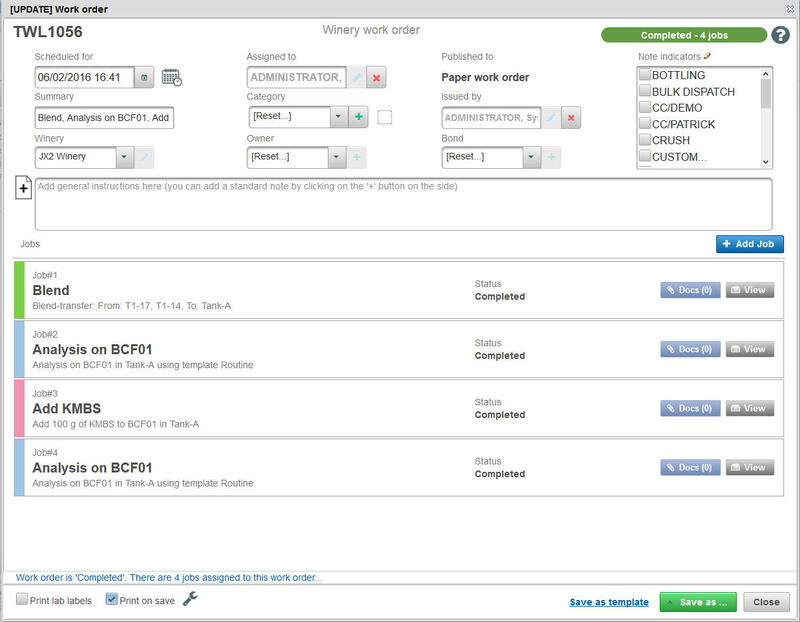 Click on New Work order template… button. This will bring up the [CREATE] Work order template screen. Provide a meaningful name to your work template. In the example below, we gave the template the name “Bottling preparation”. The description is displayed when someone is using the template, so any useful information about what the template is used for or how it is used can be entered here. Let’s take for example that we want to add an existing work order for a bottling preparation job where the tank “Tank-A” and batch “BCF01” is already existing in the work template above. The work order number is TWL1238. Let’s now go back to the work template. To add the work order above, enter the TWL number in the Add Work order field then hit [ENTER] key. 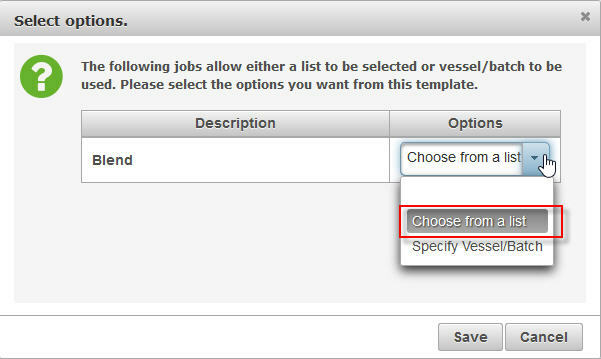 The jobs from the selected work order are added into the template. By default, the TWL number is added in the description field. We recommend you add a more meaningful description (this becomes more useful when creating a template out of multiple related work orders). The description is displayed when someone is using the template, so any useful information about what the template is used for or how it is used can be entered here. 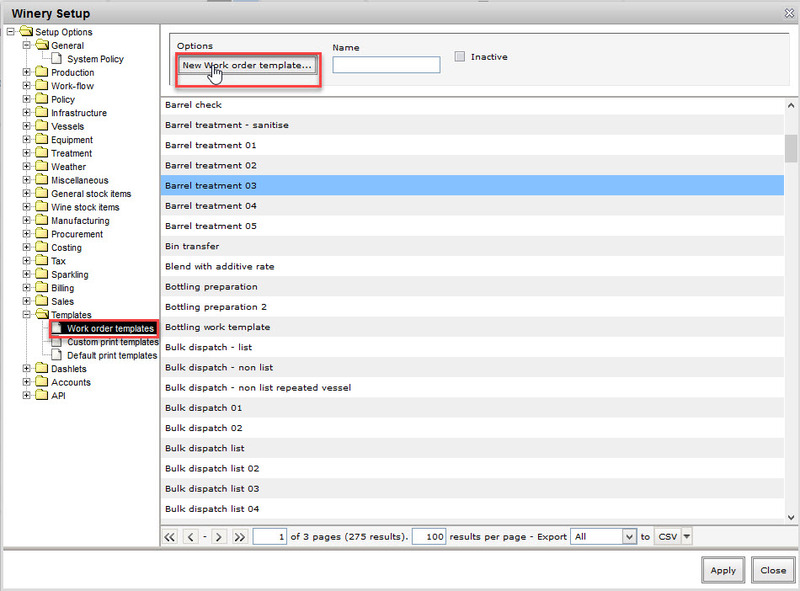 In the example below, we added “Bottling preparation” as the description, same as the template name. The blue row represents the start of a new work order in the template (for inventory notes, the row colour is orange). 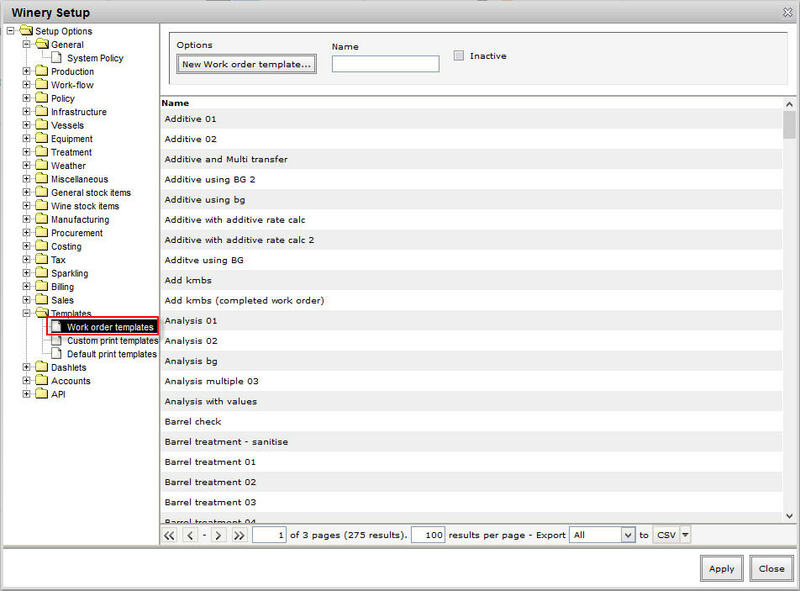 The white rows that follow are the jobs that will be created on the work order when you use the template. The Start time indicates the number of minutes/hours/days the next task is scheduled after the first job. The Duration is how long you expect it to take. If the jobs on your original work order have timing and duration information, these will automatically be provided for you. Otherwise the system will just assign the jobs a duration of 2 hours by default. We recommend you provide estimates for the start time and duration fields, as it adds a lot of power to scheduling work templates. If a template has this information included vintrace can show duration estimates on the job calendar, and also allow you to schedule work to be completed by a certain date and time. Each line has Edit and Delete options. If you click these at the work order level (the blue row) that will allow you to edit details or add extra jobs for the whole work order (in our familiar work order writer) or you can adjust the details for an individual job by clicking Edit or Delete on one of the white rows. There are also options on this page to add extra work orders and inventory notes by clicking on Add Work order or Add Inventory Note buttons. Once you’re happy with the jobs on your template, click Next. vintrace now looks at those jobs and pulls out all the unique vessels, batches and other details to allow you to create some placeholders for the template. For example, in our working example above, all four jobs use Tank-A. This is where the templates will save you time as you just need to select the replacement for Tank-A once, and vintrace will copy it into all the places that the template uses Tank-A. Don’t worry, you’ll be able to give it a meaningful name (such as “Settling tank”) so someone using the template later doesn’t need to guess what Tank-A was doing on the original work order. Before we show you how that’s done, there are one or two special case jobs that can cause some extra options to appear, so let’s get those out of the way now. All the unique details from the original jobs such as vessel, batch, owner, party, transfer volume, etc. are listed out in a table. So, in our case, Tank-A and batch BCF01 are only listed once, even though they were used on all 4 jobs. You should try and give each field a meaningful name. This makes it much easier for the person using the template to create new work orders to work out what type of vessels to use, etc. For instance if Tank-A in our example is a bottling tank, we can change its Description to “Bottling tank”. Then the person using the template knows to select one of the bottling tanks when scheduling work from this template later on. The other options for each entry here allow you to specify if the field is required (i.e. the person using the template will have to fill out the field before they can create work orders) or if the entry is fixed. A fixed entry means, you don’t want to swap the value when creating a template because you always use that equipment. For example, if you only have one Press at the winery there’s no need to have to select the same one each time. Set it to fixed in the template, and it will always be selected when you use the template. After you have made all the necessary changes on your template click on Save work template button. You are now ready to use the work template you have created. Please refer to Using work templates article. Lastly, if you need to edit or update any of your templates, you can find them at Winery Setup – Templates – Work order templates .